It all began with an order of Hat Yao fried rice, a bizarre concoction of rice fried with ketchup and chicken breast, enveloped in a thin omelette. Now, I've eaten lots of Thai dishes in nearly every region of Thailand, but have never come across anything quite like Hat Yao fried rice. I'd also never seen a green curry the way it was served the next night: soupy and impotent, and laden with carrots, cauliflower and potatoes. In fact, once I sought it out, I discovered an entire repertoire of food on Ko Pha-Ngan's Hat Yao that I'd never encountered previously. This genre of cuisine, characterised by unrecognisable interpretations of local and foreign dishes, dull flavours, a strong vegetarian bias, facsimile menus, mystery ingredients and even more mysterious origins, I called Backpacker Food. The simple fact that Backpacker Food exists begs the question: Why does one need comfort food when on the road? Isn't the point of travelling to try new things? Admittedly, there are times when a tender tummy might require familiar flavours, and perhaps this is when a queasy Italian would order the spaghetti carbonara, or when a nauseous native of the islands would choose the Pork chop Hawaiian. (I'm still not exactly sure who would order Contigi prawn, Fried chicken mayonnaise, No name falafel-style chicken or Cauliflower cheese.) But the ubiquity of such menu items on Hat Yao suggested that they were the norm rather than the exception. Backpacker breakfasts in particular seemed to have the least in common with the local cuisine. The English, with their 'Full English Breakfast' seemed to dominate this area, while the Swiss, with their muesli, often little more than oatmeal with a few cornflakes thrown in, have also had a palpable, though unpalatable, impact. And the ubiquitous 'American Breakfast' of instant coffee, lighter-than-air white bread, warm hotdogs and oily fried eggs isn't doing much to promote the image of American food abroad, and certainly isn't a good way to start the day. Even if you do make an effort to go 'local', Thai-style Backpacker Food is often just as bizarre, if not more, than the quasi-Western food. Authentic southern Thai cooking is a vibrant seafood-based cuisine that is among the most full-flavoured in the country, if not the world. 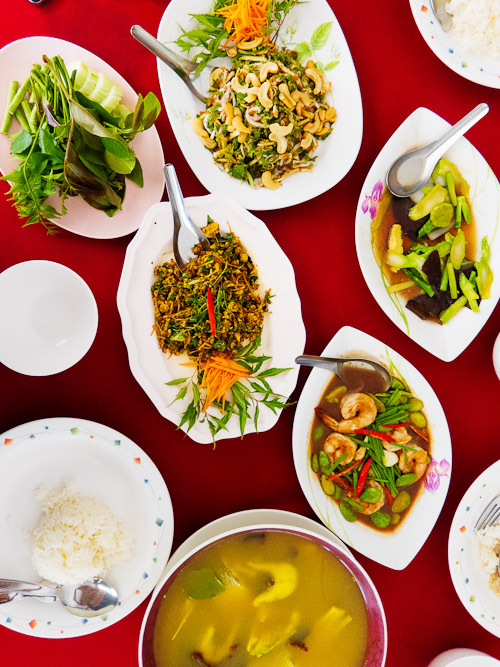 But the guesthouse kitchens of Hat Yao put out consistently weak Thai-style salads, limp tasteless stir-fries, barely-there curries, and oddly enough, despite being on an island, very few seafood dishes. Luckily, if the lack of authentic Thai food on Hat Yao was getting to you, you could always order khao phat amerigan, ‘American fried rice’ – rice fried with ketchup, sliced hotdogs and sweet raisins, and topped with a fried egg. Despite the name, the dish is found throughout Thailand and is particularly popular among Thai children and university students. It was, as far as I could tell, the only authentically Thai dish on the restaurant menus of Hat Yao. Despite this, I recently found myself on a Thai beach -- Railay, in Krabi, to be specific. It's a stunningly beautiful place, but quickly proved to be no exception to my previous beach food experience. Fortunately, a tip-off from a friend led us to Nong Joke, a restaurant in Krabi town that was said to do good southern Thai food. In fact, as we would discover over the next few days, Nong Joke did very, very excellent southern Thai food, and despite the fact that we had to pay a substantial fee for delivery, not to mention the fact that the food had to be bagged up and travel to us via boat, we ate Nong Joke's food nearly every day we were at Railay. My favourite dish was probably Nong Joke's khua kling (ค่ัวกลิ้ง; shown in the centre of the image above), a quintessential southern Thai dish of minced meat stir-fried with a curry paste. At most restaurants, this dish is spicy -- I consider it among the spiciest dishes in the country -- but Nong Joke's version was predominately herbal and included, somewhat unusually, thin strips of krachai (Chinese key), an aromatic root. We had both the pork and fish versions, both of which were served with the requisite platter of fresh herbs and vegetables -- many of them only found in southern Thailand. Nong Joke seemed to excel at soups and curries, among which were tom som (ต้มส้ม; shown at the bottom of the image), a tart, herbal fish soup soured with slices of dried som khaek, a type of local citrus; tom kathi phak koot (ต้มกะทิผักกูด) a mild, herbal, coconut milk-based soup that held fat prawns and bright green ferns; a tart and pungent kaeng som (the dish known elsewhere in Thailand as kaeng lueang, 'yellow curry') served with crunchy fingers of palm heart and meaty chunks of sea bass; and a rich, spicy chicken curry that included soft chunks of eggplant, strips of fresh chili and flecks of black pepper. The southern Thais love their veggies, and Nong Joke put together some amazing vegetable dishes including the unusual yam yot mui (ยำยอดหมุย; shown at the top of the image), a Thai style salad combining yot mui -- apparently the local name for the tender young leaves of the cashew tree -- along with roasted coconut, cashews, shrimp and chili. I particularly liked the restaurant's phak miang (ผักเหมียง), a sour, green leaf that, in the local style, was flash-fried with egg. These are just a few of the dishes we encountered, virtually all of which were exceptional. But in addition to being just plain tasty, I liked the fact that Nong Joke seemed to challenge the oft-held perception of southern Thai food as being simply spicy, salty and fishy. In fact, nearly every dish was extremely nuanced, with fresh herbs usually at the front, followed closely behind by richness and spiciness; few of the dishes we ordered were predominately salty or fishy. At our last meal at Nong Joke, when we finally got the chance to eat at the actual restaurant, I was also delighted to discover that it is just the type of Thai place I love the most: old school (30 years in business, I was told), with an emphasis on flavour over style, and with the added benefit of super friendly, casual service. It's almost enough to make me want go to the beach.